The winner will receive a fully refurbished EGO compliments of Short Term Meaningless Success Inc. (approximate retail value $0.0000042) Taxes are the sole responsibility of anyone foolish enough to pay them. The creator and sponsors of this contest are not responsible for any loss of humility stemming from misuse of the prize. I can occasionally draw video game sprites, but I tend not to be so good with basic artistic images. If I think of anything, though, I may and/or may not make and post it. He has designed banners which he says are free to use. Apparently this one is already linked to towelday.org. It would probably be a good idea to put this somewhere on the front page to give people a link to that site and design a separate one leading to towelday.net. I suspect it would be confusing if the same banner was used to link to two different sites. It's been almost a month since the call went out for a banner, but no entries yet. Never fear, I hear VogonGirl is in the process of designing one. 42 days to go and still no banner. Never fear, the Design a Banner Contest is still open. Act now and we will upgrade the previously announced prize to a SUPER-EGO! Sorry, I can't help will a banner. But I put a link on my facebook and my mustard blog. Wonderful! Hopefully our community will grow a bit more between now and next Towel Day. Incidentally, here is why I am not fit to design the banner. 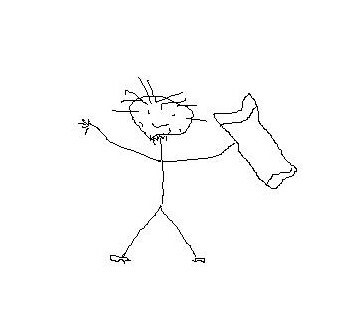 It is a little artwork I did several months ago entitled, "Self Portrait with Towel"
You can do better because I saw your D&D picture of your character. Aaaaactually... Come to think of it, I know a guy who can draw. But he's already working on other some requests of mine, and I don't want to over-burden him. Maybe once he finishes what he's working on now, I'll see what he thinks of the idea. Well even I can do better than a stick figure. Ha ha daddy! Teatime agrees with me! Well now, the more I look at "Self Portrait with Towel", the more I come to view it as a masterpiece of modern abstract art.